The Wonderful Wallaby pattern arrived today! YAY, I can’t wait to go shopping for yarn! I’m thinking of a gray heather, but saw one on Ravelry I really like, done in Plymouth Yarn Encore Colorspun Worsted. Will check with Ben Franklin Crafts, Delavan. 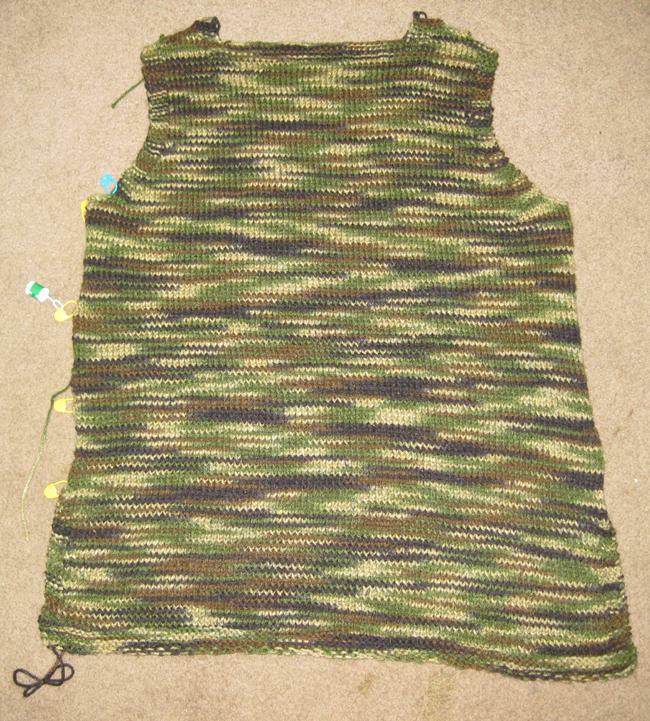 I completed the back of my Shine-on Camo Vest. The shoulders gave me a bit of trouble at first, but I’m still learning. After I realized things weren’t lining up at the center of the neck opening, I rippit’d it and started over from where the shaping first began, then, like magic, I got it on the second try. I’ve cast on the Left Front, the two fronts will go fast now. I cut my hair today-took it back 10 inches. I haven’t done this cut in 12 years, but it feels right, again. Life goes on – lock and load.